This is not the frist time this has happened to me--it started when I was a young child. I went to sleep last night at 10:05. I don't know what happened but I know I could not move or speak and something was there with me. I felt something standing on my chest with small paws. I felt four small paws. Inside of my head I was yelling get off of me. It jumped off and started to bite my hand but as I remember before I went to sleep my hands were in the bed with me. I have a small cat so I thought it might have been Angle (my cat). I tried to wake, I tried real hard to move but I could not, I tried to speak but I could not. With more trying I felt my spirt rise out of my body and I was laying in bed and standing in front of the mirror at the same time. Unbelievable. Somehow my spirit went back into my body but I'm still unable to move or speak. My eyes were open, I could see images on the wall, I tried to blink but the images were still there. I was having trouble breathing. I tried to move still to awake my mate. I could feel him moving but I could not do anything. After a while I finally move scared as hell and went to use the bathroom, returned to bed and never returned to sleep. Hey Marva, thanks for writing in and sharing this experience with us. What you describe sounds like an episode of sleep paralysis. The feeling of having something on you and biting your hands is likely an example of what is called a hypnagogic hallucination, a dream-related occurrence that frequently accompanies episodes of sleep paralysis. 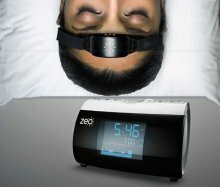 Sleep paralysis is closely linked with dreaming and REM sleep (the period of the night where dreaming occurs), for reasons you can learn about here. As a result, dream-like sensations (imagery, sounds, feelings) can sometimes accompany episodes of sleep paralysis. It's truly a rather fascinating phenomenon that happens to many, many people at least once in their lives, although some people experience it much more frequently and intensely. Understanding why it occurs and how common it can be is absolutely vital to obtaining as much peace of mind as possible during your next episode. 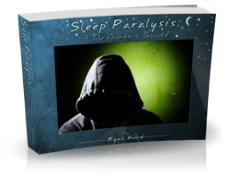 You can also read sleep paralysis stories from other visitors to this site here. Best wishes, I hope some of this information is helpful, and if you have any additional questions please feel free to ask.